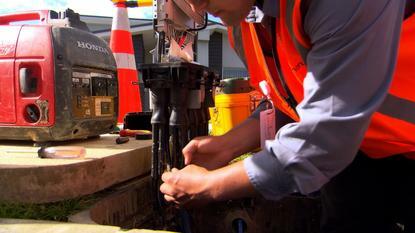 Chorus said 69 per cent of its mass market fibre connections were now 100Mbps services, and there were 30,000 1Gbps connections at the end of the quarter. (The price for the 100/20Mbps service increased from $41.50 to $45.00 per month on July 1). Overall, total broadband connections grew by three thousand to 1,187,000 in Q4. VDSL connections declined from 325,000 to 321,000 during the quarter. Peak time data demand rose to 210GB per household in June, up from 185GB in March. Fibre users averaged 297GB monthly, up from 268GB in March. Chorus said growth in demand for fibre services had increased the average lead time for eight to 13 days, despite it increasing the number of installation crews in the field from 720 to 800. At 30 June UFB fibre passed 700,000 premises, up from 643,000, including 15,000 greenfield sites and 6,000 UFB2 premises, meaning 932,000 customers were connected or able to connect to fibre, up from 863,000 at the end of March.